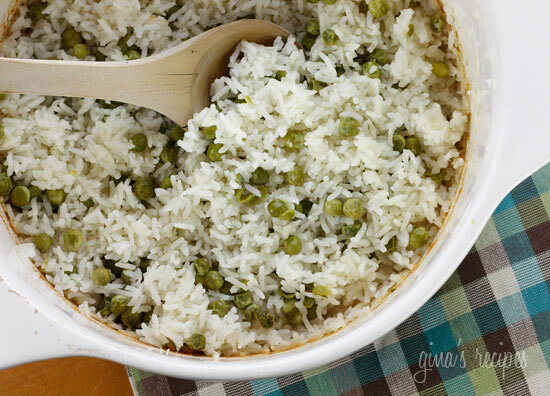 A simple rice dish with sweet peas baked in the oven. Perfect as a side for grilled shrimp or chicken. Adding vegetables to your rice, allows you to have a larger portion for less points and adds fiber. Combine all ingredients in a oven-safe baking dish with a lid. 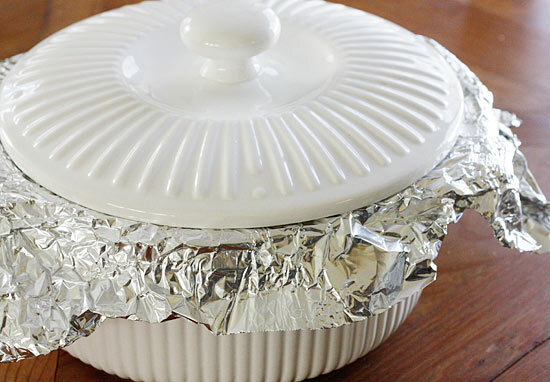 Place a piece of tin foil between the lid and the dish to ensure no steam escapes. Bake 45 minutes (do not open, do not peek, do not stir to rice). When 45 minutes is up, remove from oven and let it sit for 10 more minutes to allow the steam to finish cooking the rice, (do not open, do not peek, do not stir to rice). After 10 minutes, remove lid and fluff with a fork. Hi Gina! Do you have a Freestyle point value for this recipe? 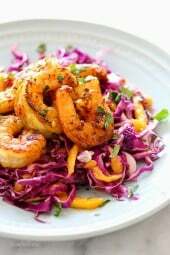 Such a nice side for your curry shrimp! Thank you for all of your amazing recipes! Thank you! These are 5 FS points. Do you have to wash the rice? Could you double the veg only & still have the same results? Made this tonight. Following the recipe exactly and came out great. Thanks for the awesome recipe! 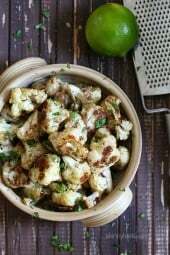 Has anyone successfully done this recipe with brown rice? LOVE this one. I've used all kinds of different veggies – frozen or canned – depending upon what I have on hand and it's a winner ever single time. If you use a veggie that has more 'water' (i.e. summer squash) than peas, you have to adjust the liquid a bit but still awesome and beautiful to serve. My family consistently request "Gina's Rice" several times a week. Versatile and delicious! Can you guys help me? I want to make this with brown rice and some frozen mixed veggies that i have in the freezer. I don't have any chicken broth and I need to make about 5 servings. I have no idea how much water to use. I made this the other day and it was okay. The texture was very different then boiled rice. It was very mushy. I followed your directions exactly, could it be that I live in high altitude (Denver?) had good flavor though. I made this tonight in my rice cooker. I added all ingredients to 1 cup rice and 2 1/4c chicken broth in the cooker then turned it on. It was perfect, delish and soooo easy! I am a huge fan of your site and can't wait to try this. Will be making this tomorrow. I noticed there were a few who said theirs came out runny or crunchy, so I was wondering if the type of dish they use could be the problem. Maybe it needs a very heavy pot. I'm going to make this in my cast iron Dutch oven similar to yours. Hopefully it will turn out great. I'll let you know how it came out. Might be silly question but do you measure butter after it melts? I was a little hesitant to try this after reading the reviews of the uncooked results, but mine turned out beautifully. I don't have a lid for my ceramic baking dish, so I covered the dish tightly with foil and placed a 9×13 glass baking dish on top. I cooked mine at 400 degrees as I was roasting brussels sprouts at the same time. 45 minutes in the oven and 10 minutes out. Delicious! Tried again at a higher temp (I was roasting cauliflower) for 45 min. and it turned out great. Thanks for your comment, Suzanne! I also made this with the chicken with mushrooms (a favorite at our house). I had been so excited to try this recipe, but it came out crunchy and watery with directions followed exactly with basmati rice. I don't live in a high altitude, either. We happened to have steam-in-bag peas and boil-in-bag rice, so dinner was still delish. I put the rice back in the oven with the chicken while my sauce cooked down and then back up to 350 while we ate. It ended up working well, but I would guess that my cooking time was doubled. What went wrong? Gina: I cook exclusively from your blog, and love all of your recipes! I tried this recipe out for the first time this evening, and this was unfortunately my first disaster. 🙁 I unfortunately ended up being in the group of people who had uncooked rice and way too much liquid left over. 🙁 I was using a gas oven, so I am wondering if this only works well with electic oven? Has anyone successfully made this with a gas oven? Thanks! I don't like peas, do you have a recommendation for another few veggies it would be good with instead?? I don't like peas either, but this was good with the peas (though next time, I'll reduce the peas). I'm trying it now with half corn and half peas. I'm sure you could also put onion, brocolli, carrots or chopped bell pepper. Good luck! For some reason this flopped for me. Usually I make perfect rice on the stove top, but this sounded really good so I thought that I would give it a try. I pared it with the chicken with mushroom white wine sauce (which was fantastic!!!) I wound up having to leave the rice in the oven an extra 15 minutes due to an unexpected visitor that came while I was cooing. That said, when I took it out of the oven, it was still full of liquid and rice crunchy. Hmmm. I will try it again a different time. I like the bake idea. I know this dish is calling for parmesan cheese. But is it the grated parmesan or the shredded king? I am making this dish for the second time tonight! We loved it, my bf actually said " oh you put some seasonings in this dish, yum" lol because apparently I cook without flavor? lol! Same problem here….full of water and crunchy after following recipe exact. I'm currently trying to finish it up in microwave. Let's hope it works out. I had the same problem my rice came out crunchy and watery and I followed the recipe exactly how it was written. My new favorite side dish! I love it! I also had a ton of water and uncooked rice after the 50+ minutes. Made it to the T. Was prob covered longer than 10 mint aftwerwards bc my chicken wasn't done yet. Such a bummer bc we ended up just having chicken for dinner. I made this for a ladies' lunch last week and it was a big hit, then I made another batch to serve my family that night for dinner…another hit! I've made many of your recipes and this is one of my favorites. Thank you!!! I really love this recipe. I put it in for an extra ten minutes to get it right. If I just do 45 minutes, it comes out crunchy and watery. I've had it come out not quite done before, and I just take the foil off, put the cover back on, and put it in the microwave for a few minutes. This did not work for me 🙁 I used organic brown basmati rice and after the 45 minutes plus 10 it was full off water and the rice wasn't cooked at all. I'm sad because the reviews are so good! I'll have to try it with a different kind of rice. Thankfully I had 2 minute microwave rice so my dinner wasn't lacking rice. please let us know if it works with brown rice 🙂 id like to try it. LOVED IT! I chopped up half an onion and added some fresh garlic and peper and some garlic and onion powder for added flavor! So Simple and tasted awesome!! I would love to know how you came up with only 4 points? I was going to make this tonight with the Chicken Rollatini and I get 6 points by putting ingredients into the calculator. The rice alone, for 3/4 uncooked is 4 points. Help!!!!! To friends who claim they cannot cook rice on the stove or rice cooker, I recommend the microwave method following instructions on the back of Uncle Ben's rice — perfect every time after you figure the water amount for your preferred consistency. I use 2 cups of water to 1 cup rice because we like it drier for dishes such as gumbo, red beans, shrimp creole here in New Orleans. Love this. My family ate rice and peas ALL THE TIME when I was growing up. It also became a major staple when I went to college…until now I thought I was the only one who liked this combo. It's so easy to make and really tasty! We actually just cooked both the rice and the peas on the stove and combined them after cooking. I wonder what the flavor difference is using your method…will have to test it out. I love corn in my rice too. I'm not sure if the altitude effected it, did you double the recipe? My question is…what are your thoughts for me? I'm in San Diego and was thinking maybe altitude had an impact. Should I use a higher temperature? Thank you for all the wonderful recipes! My husband is a meat and potatoes guy. I've tried other healthy recipes that lack taste but he has eaten EVERY recipe from your site and loved it. Hi – I have just come upon your site. i will be trying these starting today- one note. This is not actually a vegetarian recipie. It has chicken broth. I will substitute with vegetable broth. Jen, that is strange. Was the oven hot when you put it on? Was it at the right temperature? I followed the directions and there was a lot of water still in the pot after the 45 + 10 minutes. I am finishing it off on the stovetop. I hope it comes out as good! hi i was wondering, can you use canned peas instead? I just made this rice for supper, it's ready to go in the oven when the time comes. I will let you know how it is !!!! In case anyone is wondering, this recipe is fantastic doubled! I did leave it in the oven about 10-15 minutes longer though so the rice cooks completely. I also made this using water (instead of the chicken broth) and it turned out well. But I do think the broth adds a little bit more flavor. Also, my husband LOVES eating this dish with Sriracha hot sauce. We recently topped the rice with shredded pork. So yummy! Thank you Gina for sharing this recipe! I don't like peas, but I made the original recipe with a cube of vegetable bouillon in 2 cups water and this was great, peas and all! In the future if I'm using just peas, I'll use half the amount. Thank you so much Candice! It worked perfectly when I cooked my doubled ingredients 15 mins longer and waited 10 mins to fluff. I made this batch by doubling the recipe and using half corn and half peas- even better! I just heard about this site at a WW meeting. I have been looking at all of these recipes for over an hour, can't wait to try one…I think the chicken and mushrooms tonight. thank you for making it just a bit easier to stick with WW!! This dish was great! We tried with brown rice, but needed to put it back in for another 15 minutes. Candice, I have not tried doubling, bu I assume it would take the same time to cook. Gina, I love this recipe! In fact, I'd like to make it for my family when they come over for dinner – they're a BIG crowd. Have you tried doubling this recipe? Do you know how much longer I'd need to keep it in the oven or if I would have to make any major adjustments to the ingredients? Thanks for commenting, I'm glad it worked with brown rice. I'll give it a try!! Just made this and all i have to say is … OMG! The consistency was PERFECT! Soooo easy. Made it with brown rice and surprisingly I had NO problems with the timing like someone mentioned above. I don't think I'll ever make rice on the stove again!!!! Thank you! Good for you! Happy Friday!! I'm so excited about this dish, made it with your Chicken and Mushrooms in Garlic White Wine sauce….awesome. Total 8 Pts+ for the whole meal. I have enough points left on this wonderful Friday to enjoy a glass or two of wine. Thanks so much for a lovely meal. Just made this with brown basmati rice. Unfortunately I took the lid off after 45mins – not reading the instructions properly! I have made it with frozen corn and I can't wait to try it, it looks delicious. I made this recipe last night and found it to be so simple and tasty. I ended up adding a bit more parmesan for the saltiness and the peas I added during the "fluffing" process which helped them retain their gorgeous bright green color. The dish was a hit! Thanks so much for sharing your delicious recipes! Thanks so much for sharing your recipes. I made this one over the weekend and I can happily report it was a winner. I did sub edamame for peas (its was I had on hand) and used veggie broth (gave up meat for lent). Love the photos. I made this over the weekend and it turned out perfect! I hate trying to make rice, but this was such a hassle free experience I will be making this over and over. I think next time I might try adding some other vegetables like onion or broccoli. I modified this to make about 1 serving! I thought it was really good, and, I didn't have chicken broth, so i used water+spice instead! Mix it all up in a small casserole dish, cover with foil and lid, bake at 350 for 25 min and then let sit 10 min. Usually you are supposed to let basmati rice soak in water for about 15 min before cooking, and I didn't do that so the rice was a bit undercooked. I wonder if I were to up the oven time of this…maybe it would even out. I'll have to test next time! Made this night before last and both DH and I thought it was great! So easy to make. I added a chopped onion (because we think everything is better with onions! 🙂 ) Next time will up the parm cheese a little, but definitely a keeper. As usual, Gina! Made this tonite, had no peas, so cooked it without it, then when it was done added spinach! I bet this would be good with broccoli too. I love your recipes, made so many of them and ALWAYS love them! please keep at it Gina! you rock! Basmati would be fab! Doubling the recipe should work just fine. You would cook it for the same amount of time. I'm happy you all like my experiment! Rice is one of those things I can cook in my sleep, but I know so many people have problems with it so this is an easy solution… And tasty! I just tried doubling the recipe the other day to go with your chicken tikka masala. When I finally opened the pot after allowing it to steam, it had barely started to cook. So I think I threw it in the oven for another 25 minutes and repeated the steaming process and it was perfect. The two went together wonderfully. Oh my goodness. This rice was absolutely awesome!!! I made this rice with the roasted garlic broccoli and the Asian glazed drumsticks (though I used chicken breast) and it all came out phenomenal! This is the first time I've made rice that I didn't burn! I love it! Thanks, Gina! I made this last night with Basmati rice, and it was delicious! However, it only made 4 servings, but it was so good – I brought the left overs in today for lunch! Next time I might try to use some more veggies, the peas were great! I am making your chicken curry on Wednesday and was wondering if you think Basmati rice would work just as well. 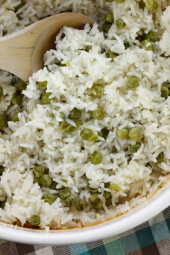 Love the flavor of Basmati rice and often make it with peas when I am making an indian inspired dish. Thanks! I made this last night to accompany baked porkchops and some nice crusty bread on the side and this dish STOLE THE SHOW! I could eat this all by itself! The portion size was big and filling. This was so easy and chances are you have all of the ingredients on hand. I recommend this dish 100%, it was very delicious! Oh darn, brown rice cooks so much longer! I've yet to try Alton Browns recipe. I tried this with brown rice, and after 45 minutes, it hadn't even *thought* about starting to cook, yet. :o( Sooooo…I have it in for another 45, now…wonder if it'll work? I tried it with brown rice as well, didn't work. I ended up finishing it off in the rice cooker. Had this tonight for dinner along with the Crockpot Pernil recipe. I did love the Pernil, BUT, I think the rice was actually the hit of dinner! So good! And I love how easy it was to throw it all in the oven! Thank you, Gina!! This was delicious, as I've come to expect from other recipes at your blog! However, at an altitude of 4,200 feet, I had to cook it for 15 minutes longer. I used a clear dish and could see the water after 45 minutes. I'm glad I kept going with it though as it is a new favorite dish of mine! Thank you SO much for getting back to me on this!!!!! I'll keep this in mind if anyone else has a problem. Thank you! I'm the "anonymous" above who stated that I couldn't print correctly with the new "PrintFriendly" button, even though I'm using Firefox. I have now deduced what the problem was — I use "NoScript," a valuable security add on, with Firefox. NoScript disables all scripts on a web page and allows you to choose which ones you want to run. I thought I had allowed all the scripts on this page to run, but today I noticed a message that a script was being blocked. Sure enough, it was the "PrintFriendly" script, and as soon as I allowed it, the print feature worked as intended. Just thought I should let you know in case others experience this. Thanks for your GREAT web site. IS THIS POINTS VALUE WITH OUR NEW WEIGHT WATCHERS PLAN? i would much rather bake rice, than cook it stove top. i love the set it and forget it aspect. i try to eat brown rice, tho, or i add equal parts quinoa to my white rice to boost protein content, since it takes the same amount of time to cook. i'm going to look for alton brown's baked brown rice, as mentioned above. This sounds so delicious! I love how easy it is too! Oh no!! You're the first person to tell me this since the new printer button. I suggest you save it to a pdf so you can view how many pages it generates. Then you print page 1 only. Another great recipe, but I have a comment about printing. I'm using Firefox, and clicking on the "print friendly" button produced a nine page document. The recipe was on page two, and the rest of the pages were mostly blank with one or two little items from the site. Any idea of what's going wrong for me? Thanks! Lots of people have problems making long grain rice on the stove, I have it down to a science. But this is a lot easier. Thanks Veronica, I will try that next! Yes, this would work on the stove or a rice cooker, I'm not sure if the liquid ratio is different in a rice cooker, I don't use one. Jim, thanks for the tip! 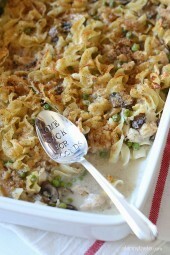 yummy I think I will be making this tonight with my slow cooker pork ribs!!!!! You might try putting bit of lemon juice in with your rice. It will make it fluffy.Don't measure much. I would guess 2tsp for a cup of rice. would this work with a rice cooker? I love baking my rice–it's the next best thing to a rice cooker! I usually use brown rice and it turns out so much better than on the stovetop–a very reliable method. I use 1 1/2 cups brown rice and 2 1/3 cups water (use oil/butter & salt as preferred) and bake at 375 for an hour. I look forward to trying this. I am not fond of peas but I will try it with green onions, carrots and celery. Yum! Kristan, sounds yummy! I don't like parboiled rice but it's great for those of you who struggle with rice. Rice needs steam to cook, so the key is to not open the lid until it's done otherwise you lose all the steam and ruin the rice. Looks great! I make a pork chop dish that cooks rice and carrots in the oven (with the pork nestled inside all in one dish – so good). I've always used parboiled rice because I have been nervous about making sure the rice gets cooked right. I think I will try it with your ratio. I can't cook rice to save my life (on the stovetop or in a rice cooker) so thanks for giving me the courage to try it out with regular rice and not parboiled. TJ- ooh thanks! I'll check that out!! I love having an excuse to turn my oven on now that it's so cold here in New York! Shelly- Amen! Finally got the printing issue resolved! I LOVE the new printing format! It saves me so much paper. Thanks for changing! !